After searching for another Toyota i found this beauty...a 1999 Corolla G6. Bought it last week to become my new daily driver. No rust, 230.000 km on the clock, already sitting on some FK coilovers and 17x7 wheels. for this car imo. I think i will change it for some 15" or 16" wheels and drop the car a bit more to the ground. I agree with you on the 17 inch wheels. 15 or 16 suits the e11 the best imho. 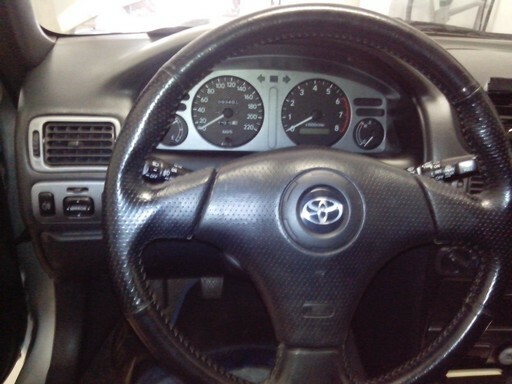 If you want a 3 spoke steering wheel, i suggest the wheel of a t23 Celica (or the facelifted corolla e11 G6). They can be easily installed in the e11. And thx Perre for the 3 spoke wheel tip...will try to find a nice used one...!!! 17's are ok for the look...but it's not perfect for steering response & performance. We will see...this summer i will drive with the 17's and during the winter period search for some smaller and lighter wheels. I put on one of my old TS 15" wheels for a quick test. I would say yes...15" does look good on the Corolla.